There is nothing like having a good book to read. An enthralling piece of fiction and as you reach the last line on the page, the desire to turn over and read on is compelling. ‘I can’t put the book down’ is often the cry and the measure of a really good tale. Of course the author does not tell you everything and much is left to your imagination as the characters in the book start to take shape in your mind. In much the same way a photograph also tells a story and by leaving key elements out of the image the viewer is left to wonder and to complete the story behind the picture in their minds eye. 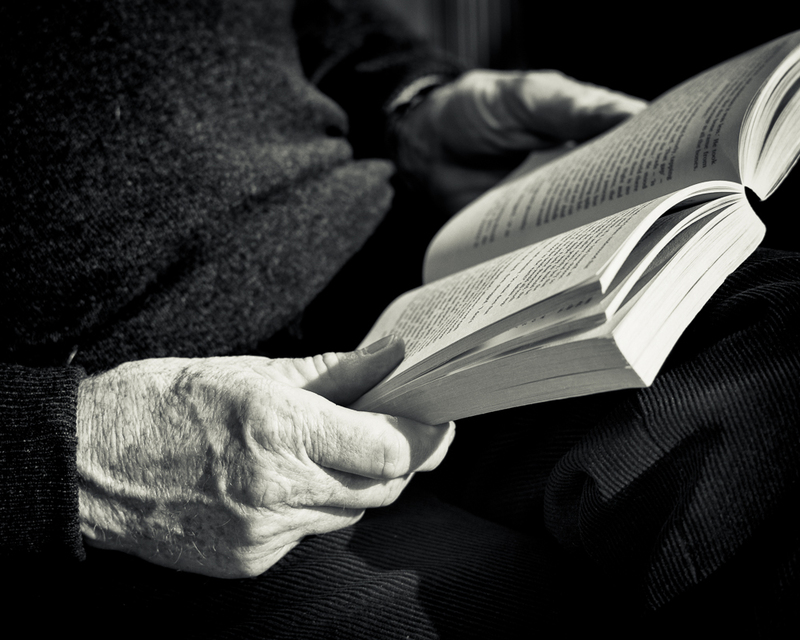 This simple close up of a pair of hands and an open book is perhaps a good example. The hands give you a clue as to how old the reader might be; the jumper and corduroy trousers also suggest a person of a certain age. The reader is already a good way through the book which might infer a desire to carry on. As to the genre of the book itself we have no idea and with the limited depth of field, few words if any are discernible. The light on the hands and the book give the distinct impression the reader is outdoors, enjoying the sunshine but it’s still cool enough to be wearing warmer clothes. I know the answers to these questions as I asked the person if I could take this shot. He was more than happy to oblige although he might have thought it strange that I would wish to do so.